NASA's Aqua satellite provided an infrared view of Super Typhoon Kong-Rey as it continued tracking through the Northwestern Pacific Ocean. Another Super typhoon, Trami, passed through the same area one week ago and cooler waters it left in its wake are expected to affect Kong-Rey. 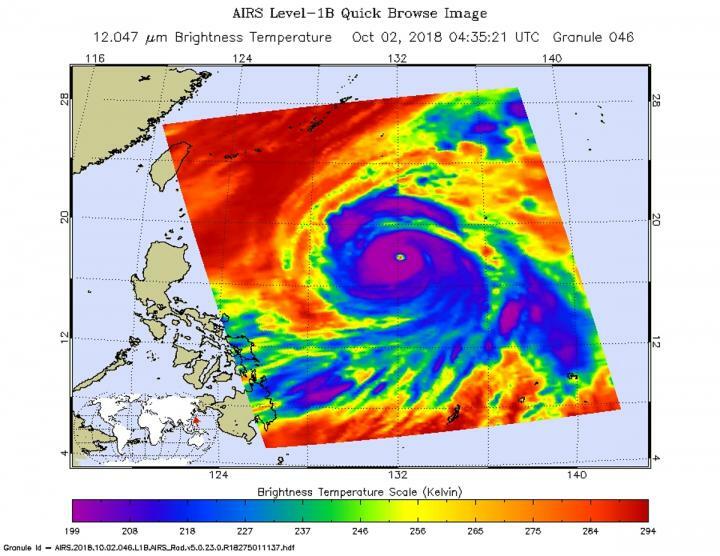 NASA's Aqua satellite passed over Super Typhoon Kong-Rey on Oct. 2 at 12:35 a.m. EDT (0435 UTC) and the Atmospheric Infrared Sounder or AIRS instrument aboard analyzed cloud top temperatures in infrared light. Coldest cloud top temperatures were being pushed northeast of center and were as cold as or colder than 208 Kelvin (minus 85.2 degrees Fahrenheit/minus 65.1 Celsius). Cloud top temperatures that cold indicate strong storms that have the capability to create heavy rain. The Joint Typhoon Warning Center noted at 11 a.m. EDT (1500 UTC), "Animated enhanced infrared satellite imagery shows Kong-Rey has maintained a well-defined eye with deep convection wrapping around it. However, the deep convection [strong development of thunderstorms] has become slightly less symmetric over the past several hours, especially in the northeast quadrant. The center of Super Typhoon Kong-Rey was located near latitude 19.2 degrees north and longitude 130.9 degrees east. Kong-Rey is currently about 493 nautical miles south-southeast of Kadena Air Base, Okinawa Island, Japan. Kong-Rey is moving toward the northwest. Maximum sustained winds have decreased to near 155 mph (250 kph/135 knots). Kong-Rey will continue to encounter cooler sea surface temperatures by Oct. 3 which are a result of upwelling (bringing cooler water from the ocean bottom to the surface) produced by Super Typhoon Trami which passed through the area several days ago.